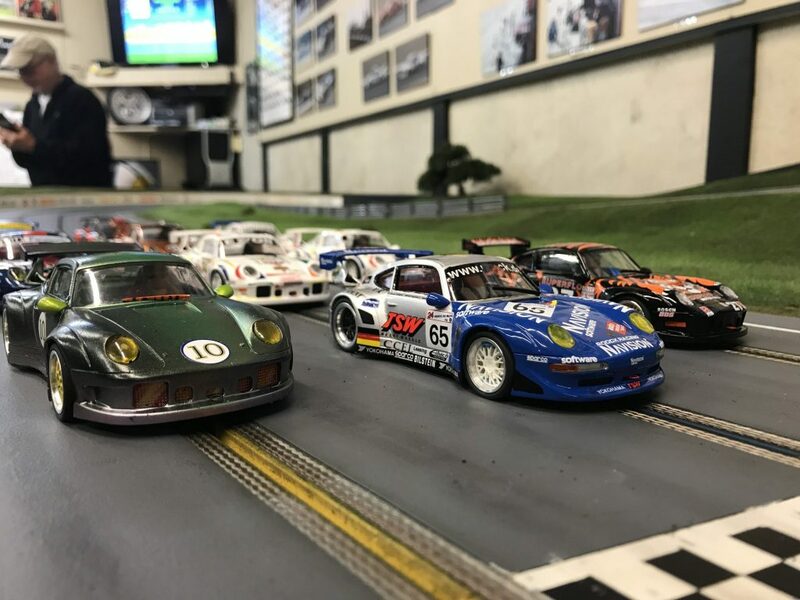 You want to see some close racing? It does not get much closer than this. The third round of the series witnessed the third different winner in as many races. 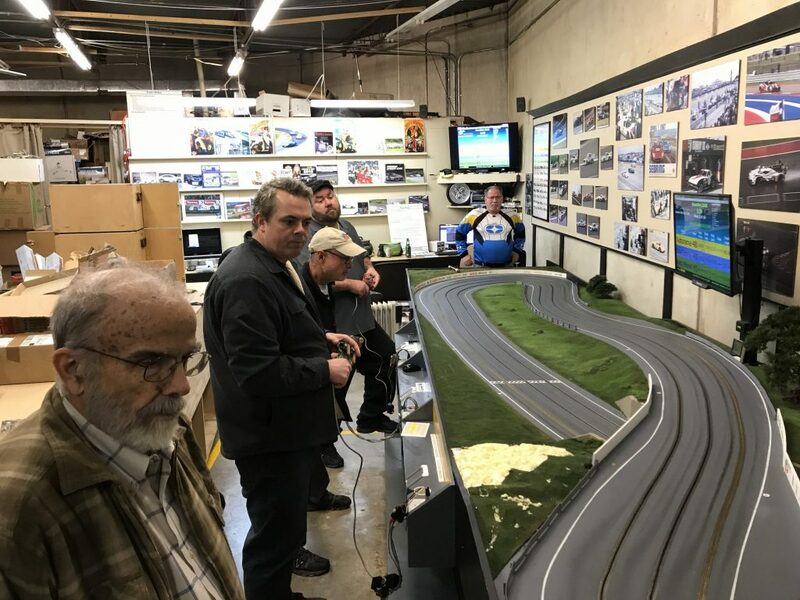 Not only was there a new race winner the racing was getting closer as more drivers were coming to grips with the set up and the driving skills it takes to push these RevoSlot cars to their limit. 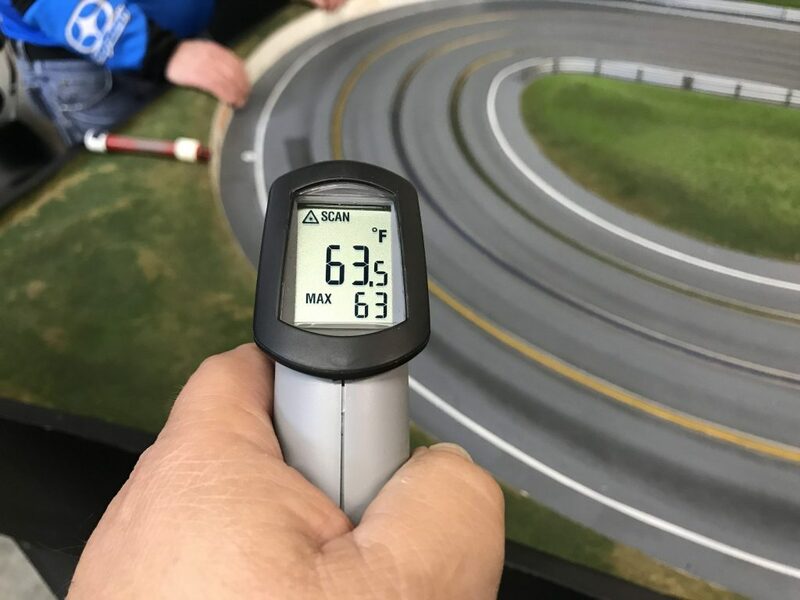 The track was in great shape with the temperature at 63.5 degrees and the room temperature was at 68.5 degrees with 62% humidity. It was warm enough to get away with wearing just a long sleeve shirt or a light jacket. No need to worry about wearing the full winter jacket. Tire wear was once again one of the main topics of discussion. Many racers installed new rear tires and one or two even installed new front tires. It was obvious that everyone learned more about properly setting up their cars as all of the cars looked much better in pre-race tech inspection. All cars passed inspection with only one car having rear tires that were right on the boarder of being illegal. It will be interesting to see how they wear for the three heats and if they pass inspection after the race. Motor strength was a topic of discussion especially after the poor performance of some of the cars in the last race. Drivers who were willing to have the RPM of their motors checked at the end of the race could get a better understanding of whether or not their motor was a reason for their lack of pace. Let’s see how many racers take advantage of this opportunity. The race was very close and very exciting. 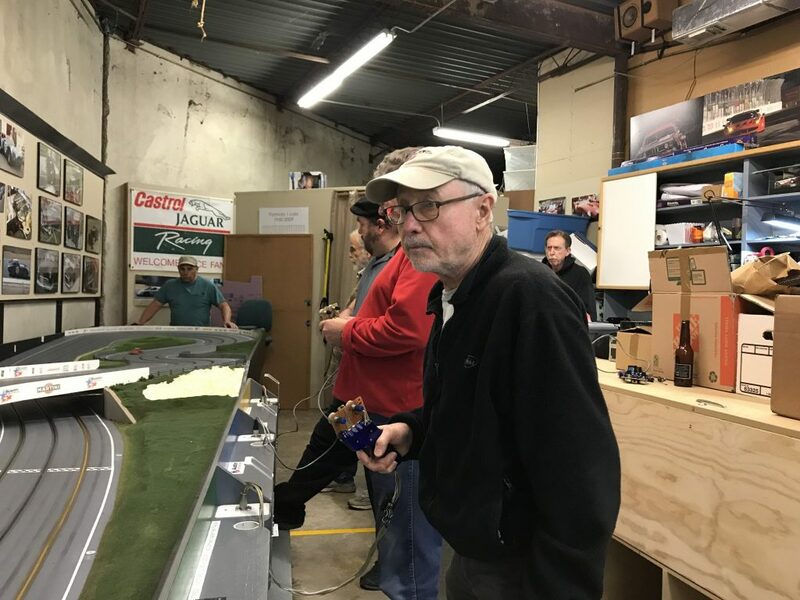 The first round had the last rounds winner and lap total record holder Steve racing against Roy who set the series fastest time along with Randy from the B Group. 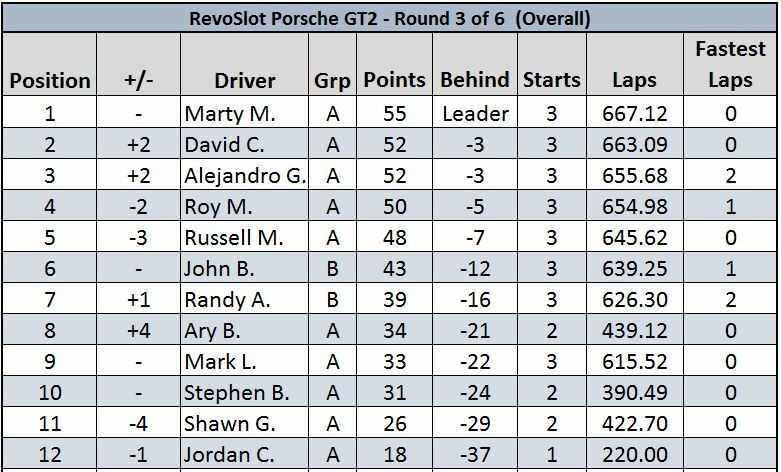 What happened throughout the heat is what makes this series so fun – Steve could only manager 68 laps to Roy’s 73 and then there was Randy from the B Group who had a strong run with 71 laps and set the fastest lap at 3.955. Fantastic run for Randy. His fast lap lasted to the end and Randy picked up the one extra point for fastest lap in Group B. 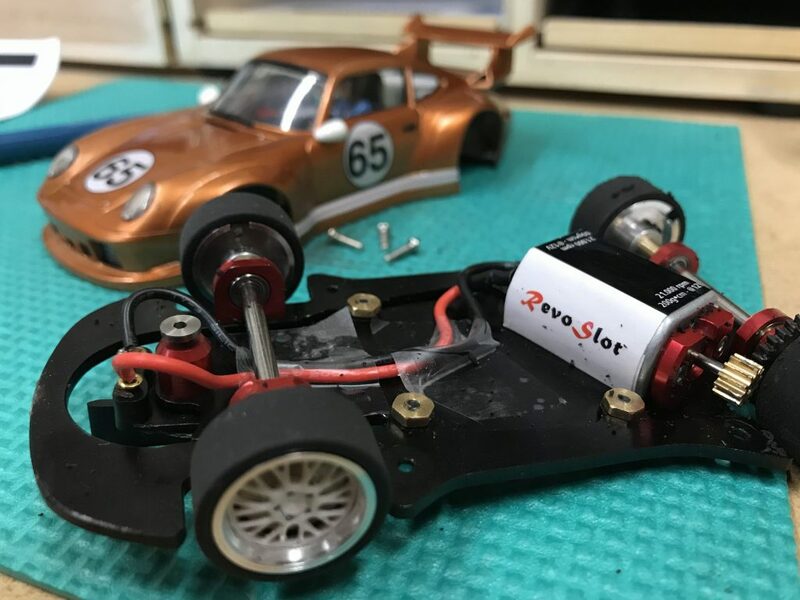 The next heat had Ary join in for his first run of a RevoSlot car in a race. Ary and Roy had a great battle with both finishing with 73 laps. It was obvious that Steve was having some issues with his car and only managed to complete 67 laps. The third heat witnessed Ary dropping the hammer and running 77 laps in the green lane. Marty joined but could only manage 73 laps and Steve’s car finally gave up with a mechanical issue stopped dead on the track. Steve did manage to the car running again but lost too many laps to be a factor in this round of the series. The fourth heat had Ary run 75 laps to Marty’s 74 and Mark joined in and managed 68 laps. This put Ary in the top spot for now with 225.37 laps. The fifth heat had Marty run 74 laps to Mark’s 70 and Russell’s 69. Russell has been unable to find the speed he had in the first round of the series and will be first in line to have his motor checked to see if that could be one of the issues. The sixth heat had David join in and he wasted no time in setting a fast pace. He put in 75 laps while Russell totaled 70 and Mark ran 69. 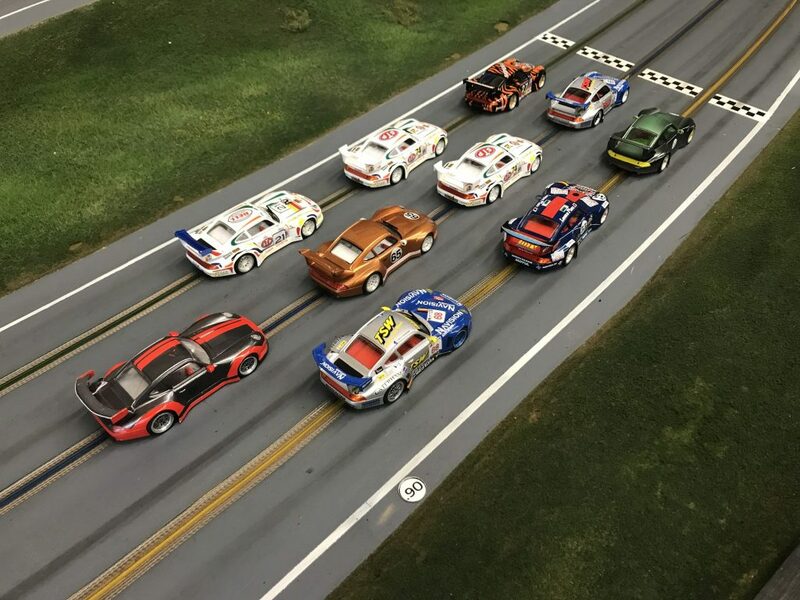 The seventh heat had some great racing between Alejandro and David with both running 74 laps while Russell ran 70 laps. The eighth heat was big for David as he was chasing Ary’s total of 225 laps. David was not only chasing, he was being chased. Alejandro was putting in some good times and lap totals and could catch David if he had an epic heat. When the five minutes were up it was David finishing with the same 225 lap total as Ary but he was a scant 5’ behind Ary’s finishing position. Be sure to read the take-a-way’s section so you get a good understanding of just exactly how close 5’ is after running for fifteen minutes. Not to be out shadowed, John joined in and ran a 71 laps. The ninth heat had Alejandro running to catch David and Ary. It was obvious he was pushing as he set fastest lap with a time of 3.821. As fast as that time was he was unable to keep his car in the slot and by the end of the heat he was still three laps behind second place. John ran 71 laps and Randy joined back in and ran 67 laps. 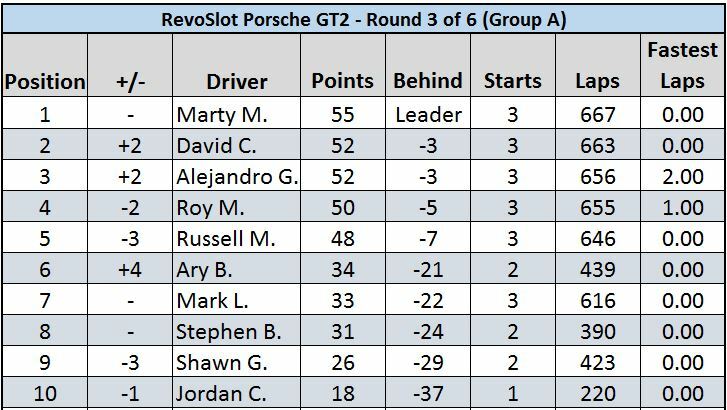 The final heat had Roy join back in and the pressure was on him to grab the final podium spot or at least catch Marty, now in fourth, and get as many points as possible to help his chances to win the series. Roy had a good heat but was only able to run 74 laps and finished 1.5 laps down on Marty to take fifth place. John had another strong heat with 72 laps and finished on top of the Group B podium with a total of 214.9 laps. Post-race tech went well with only one car not passing. This was the car that had a rear tire at the minimum in pre-race tech. As expected, it was below the minimum at the end of the race. Other than that, all the other cars passed with flying colors. 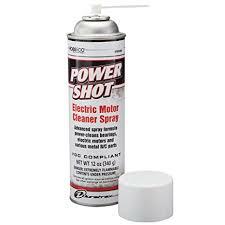 Does my motor look slow to you? 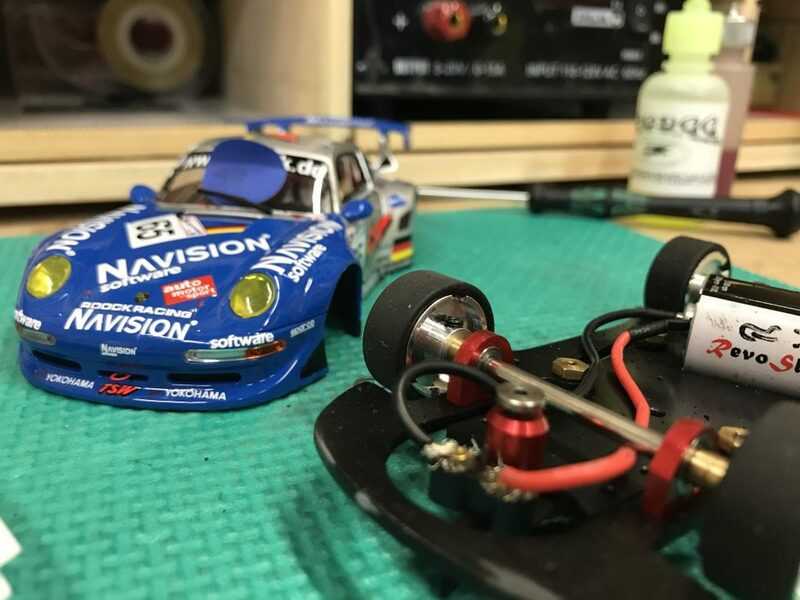 As mentioned earlier, some of the racers allowed their motors to be checked to see what the RPM range was so we could get a better understanding of what the variance was in these well-run motors. Here is what we discovered, all motors checked at 12 volts. As you can see, there was not a big difference in the motors. 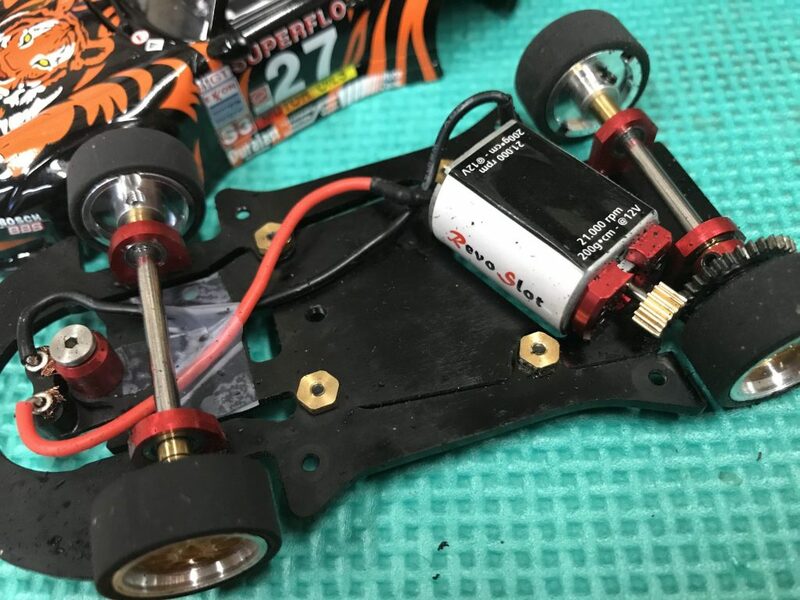 There are two factory fresh motors on the way that we will be checking as well to see how they compare to these run in motors. We will also be checking more before the next round and will post any new information as it becomes available. A decrease in speed is not always the fault of the motor. 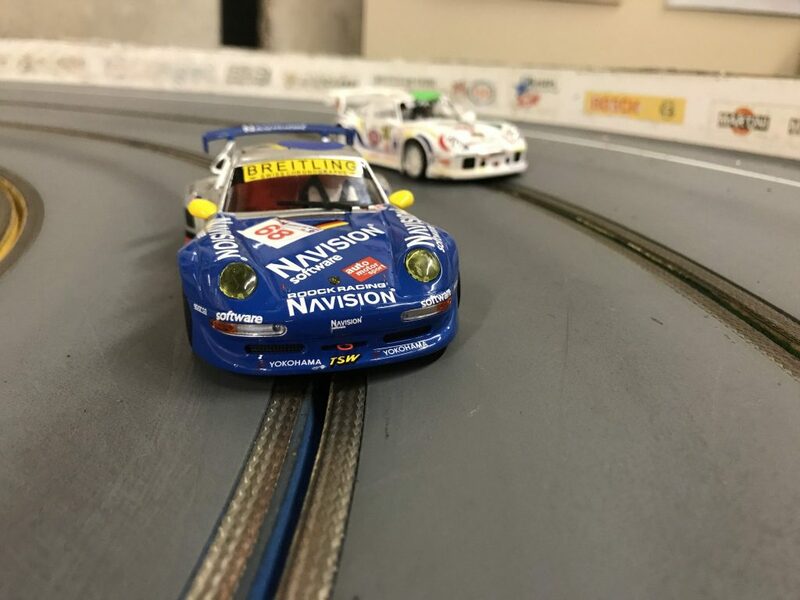 There are many other factors that can affect the speed of a slot car. The motor is a good place to start but the next thing you should check is the wheel RPM. 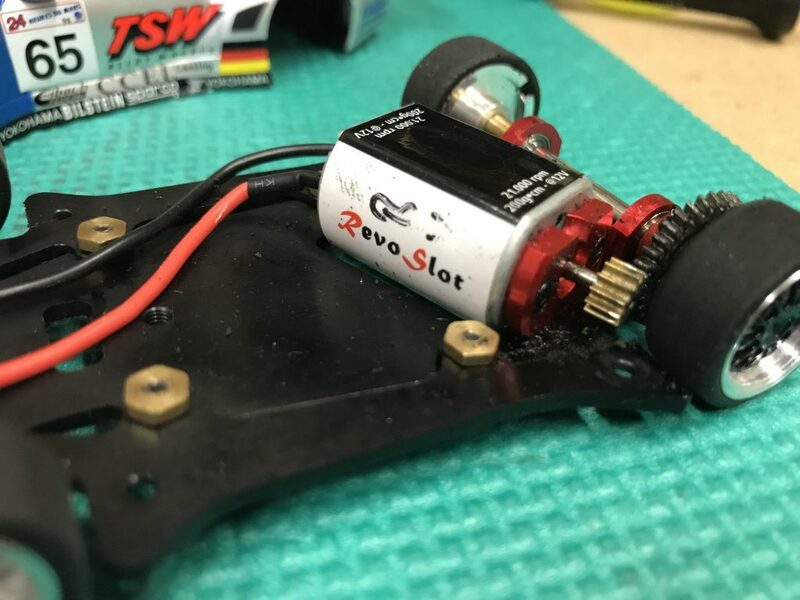 Using some simple math, you can use take your current gearing and with the motor RPM come up with a calculated wheel RPM. If there is a drop off of more than 5% from the calculated number, there are other items that need to be checked – the rear axle bushings and the gear mesh. Both of those items can have a huge effect on the performance of your car, especially in a spec series like we are running. The other thing that can influence the speed of your car are the diameter of the rear tires. Why? The larger the tires the more rollout/forward travel you get from each tire revolution. How important is that? Let’s look at two different cars with everything being the same except for the diameter of the rear wheels. Both cars are running a 12t pinion and a 33t crown giving us a gear ration of 2.75. They both have a motor that has 21,900 rpm at 12 volts. One car has tires that are new and have been minimally trued to make them round and smooth. These tires have a diameter of 20.95mm. 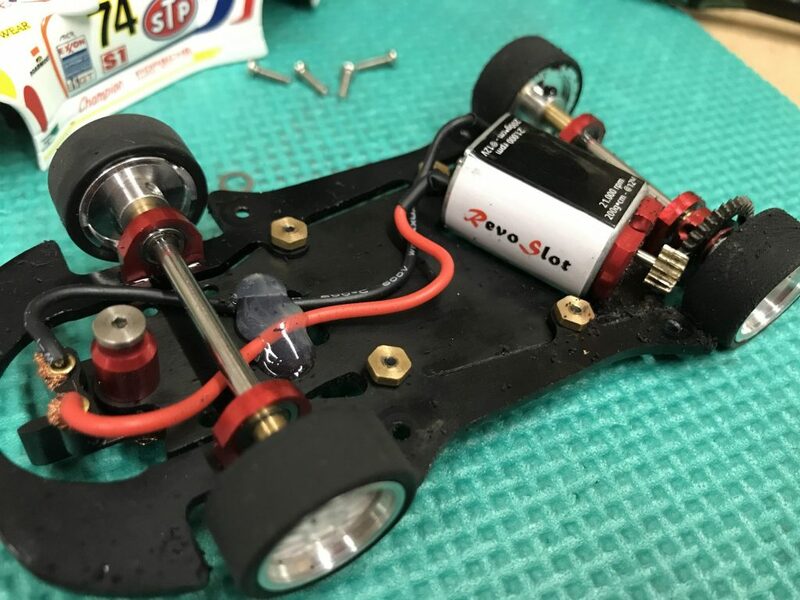 The other car has tires that are well run and have a diameter of 20.40mm At 12 volts the roll out for the car with the 20.95mm tires is 28.66’ feet per second. The car with the 20.40mm tires is 27.91’ feet per second. This is a difference of 2.62% or 9”. Yes, nine inches! Who would not want to have an additional nine inches of room at the end of every straight? 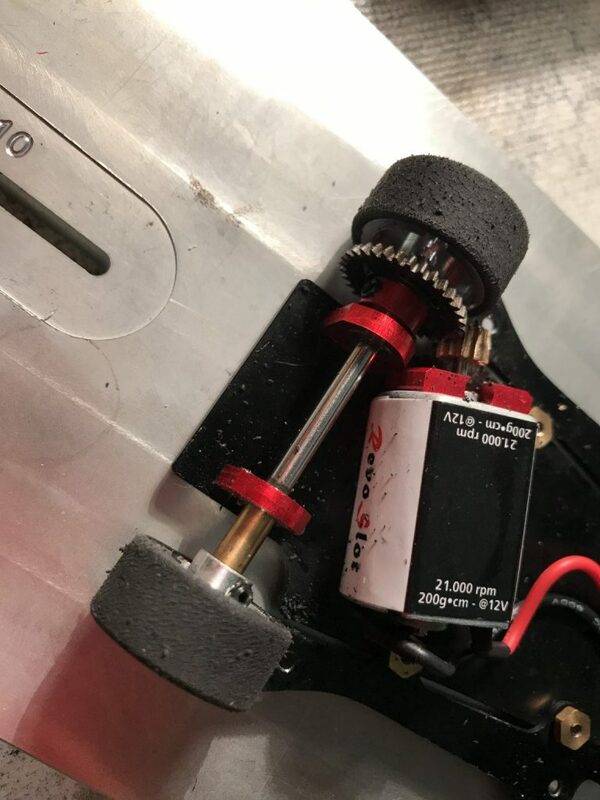 You could have a motor that runs at 21,400 rpm with the same 20.95 diameter tires and you would only lose 1.2” at the end of the straight. This shows how important the diameter of the rear wheels is to increase your top speed. I fully understand that this does not take into consideration the higher center of gravity with the larger wheels that could affect your cornering speed but the straight line speed should be very noticeable. That is not to say those tires will stay that diameter forever. All you have to do is look in any of the corners and you will see lots of little BRM shore 30 balls of tire rubber. These tires do wear quicker than ones we have used previously. A big part of this is the 98gm weight of the cars and the fast pace everyone is running. 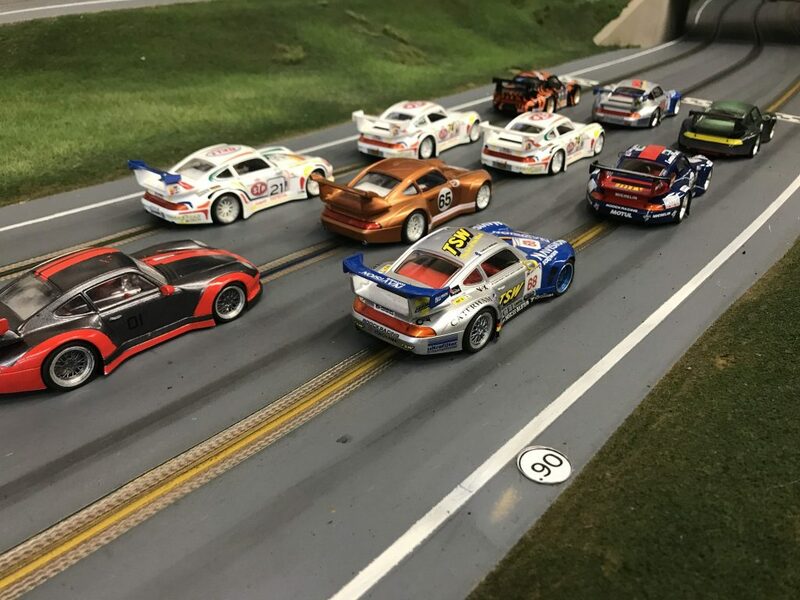 The racing was very close and put pressure on every racer to do the best possible job to set up their car and to be as mistake free in their driving as humanly possible. There were additional set up tips being discussed among the members – newer, larger diameter rear tires work better. The rollout difference is not big, but the cars seem to work better on fresh rubber. Sounds like a discussion in the pits for a 1 to 1 race car. Difference between 1st and 2nd place. The difference between 1st and 2nd place in this very tight series was just 0.11 of a lap. Let’s break that down in time to see what the actual difference was. Each lap is 54’, Ary ran 225.37 laps and David ran 225.26 laps in 15 minutes. Doing the calculations, the difference between 1st and 2nd place was a scant 0.44 seconds. Forget about one less de-slot. 0.44 seconds is one minor slip up or not getting on the throttle quick enough in one turn. In any other form of real racing this would be a photo finish. Crazy close racing. Difference between 1st place and 10th place. The difference between 1st and 10th was only a 7.987% difference. This is down from the second race where the difference was 8.779% and the first race that was 9.471%. The difference between the 1st place racer and the last place is the closest we have ever experienced. 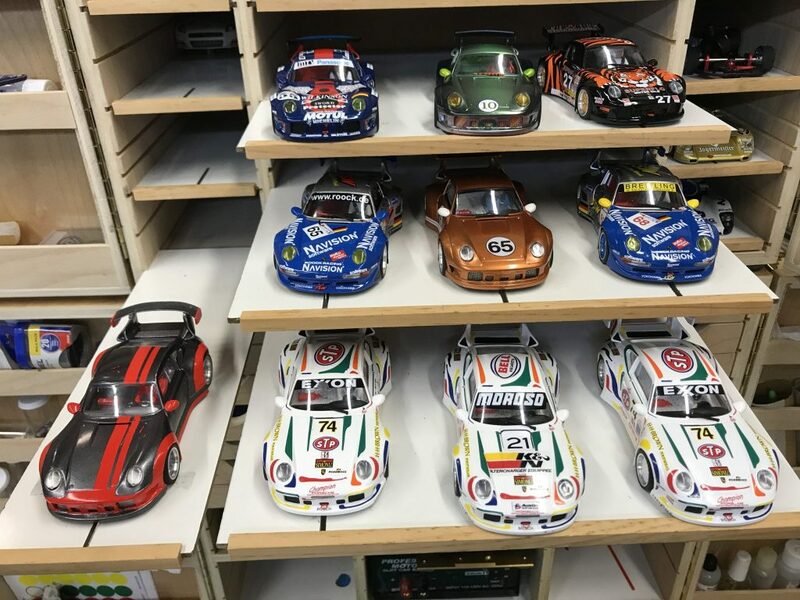 This is one of the main reasons to run spec racing and especially with these cars where the weight of the car makes them less prone to de-slotting. 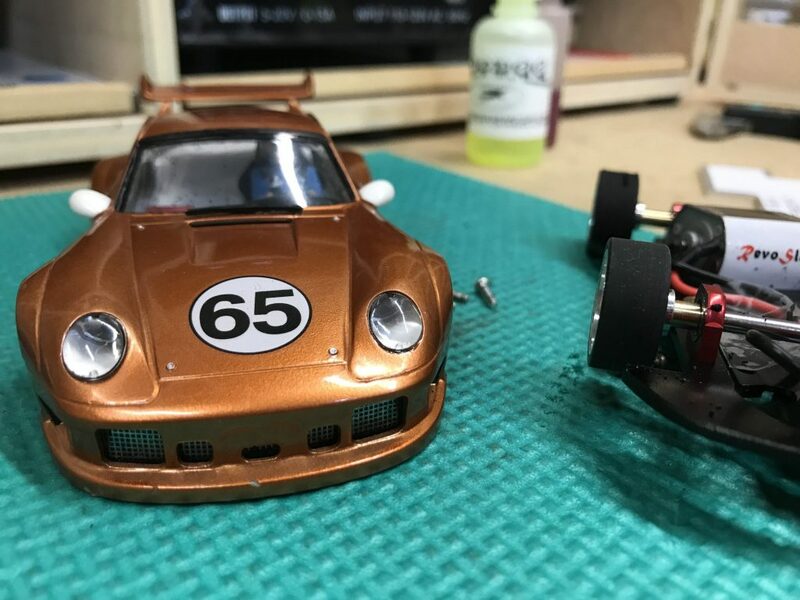 Fast but still not fast enough. The first race in the series saw the fastest lap put down so far with a time of 3.800 set by Roy and his STP car. The most laps ever run was in the second race with Stephen putting in 225.99 laps in his custom liveried car. Racers have come close to both numbers, but no one has eclipsed them yet. Anyone out there feel like they can hit a 3.79 fast lap or a total of 226 laps? Let’s see what the racers bring to the next round of the series. I can’t wait!